Do you want a better camping experience? 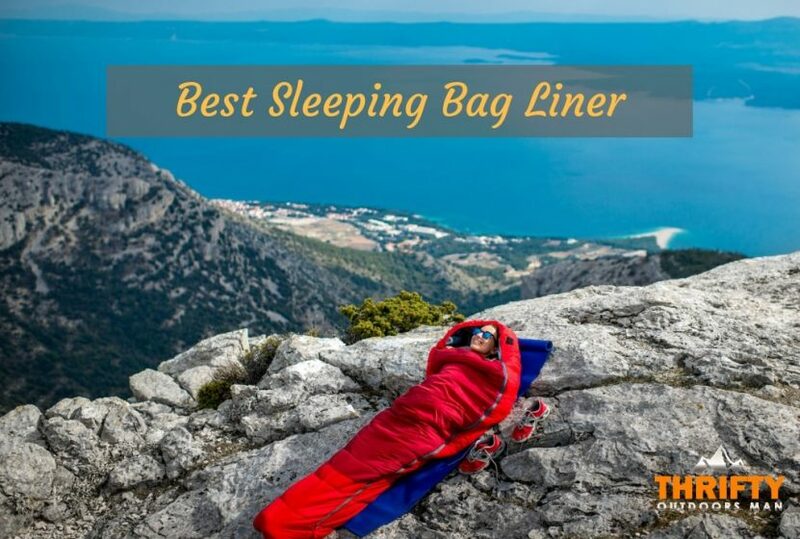 One option you should consider is the best sleeping bag liner. It can provide various benefits to your sleeping bag related to warmth, insect-protection, hygiene, and longevity. We’ll be reviewing some of the top products on the market. That includes the sleeping bag liners’ features, benefits, and drawbacks. This can help you pick the best product for your needs. The sleeping bag retains more body heat. 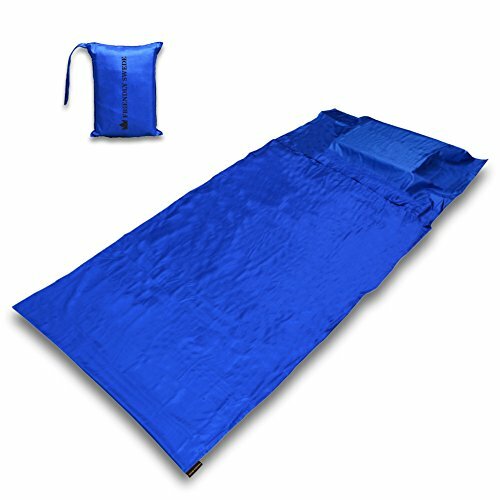 There’s less shock sliding into a sleeping bag that’s cold in the fall/winter. The liner keeps sleeping bag clean and adds extra warmth. The liner is easy to get into the sleeping bag even mummy bags. The liner is also easy to wash, so it looks and functions like new afterward. The liner improves the bag’s comfort rating. It makes the sleeping bag more comfortable. It’s a good option when renting a sleeping bag for hygiene purposes in case there are still bacteria in the sleeping bag. Sea to Summit works to develop products that are in line with the Australian attitude that’s independent/free-thinking. The company produces equipment that’s lightweight/nimble. The company’s gear works excellently, so owners are inspired to go hiking/camping more often. The Thermolite Reactor Extreme is the warmest sleeping bag liner offered by Sea to Summit. The fiber threads function like a polar bear’s hollow fur by effectively trapping heat. The Thermolite fiber adds warmth. This provides the warmest fabric possible. The Thermolite Mummy Liner features 10grams/sq. Meters thermolite construction in the liner. It adds 25F/14C of warmth to a sleeping bag. This provides more comfort during cold winter nights when you’re camping. This orange sleeping bag liner includes a mummy shape w/ a box foot. This helps to retain body heat within the sleeping bag, which in turn helps to keep campers warm during cold weather. The liner also has other key features. They include a drawcord hood that has an attached mini cord lock. That provides more convenience when using the sleeping bag liner. The liner is also very easy to wash. This helps to keep the liner cleaner for a longer timeframe. This, in turn, helps to boost the lifespan of the unit since you’ll have to wash it less frequently. When cleaning a sleeping bag or sleeping bag liner, this wears down the units faster. However, like when maintaining sleeping bags it’s important for the liner to be easy to wash. You’ll be more likely to wash the liner regularly due to this feature. Make sure to read the washing instructions carefully in order to get the best results when cleaning the unit. Good for campers/hikers/travelers. The liner fits in s small bag and can be washed easily in the washing machine. This helps to prevent bedbug issues. The fabric is comfortable and breathes well. Liner extends up to the head. The socket can accommodate a full-size pillow. This provides a better experience for the sleeper. Liner washes easily including machine wash. When you hang up the sleeping bag liner, it also air-dries well. The weight is also light for more convenience. This sleeping bag liner is one of the top-sellers on Amazon. It includes a pillow pocket to make it easier to sleep with a pillow. This is critical since it makes sure your head/neck are provided with enough support when using the sleeping bag liner. Whether you use it with a sleeping bag or as a stand-alone unit, a pillow is essential to get a good night’s sleep. On the other hand, sleeping can be more robust if you sleep in the liner without a pillow since your head/neck aren’t supported properly. The liner is made of polyester that’s sturdy and washable. This makes the liner feel soft when it’s contacting your skin. It’s not only crucial for the sleeping bag liner to be warm but also comfy. This unit’s texture is very smooth and comfortable. The liner can help to keep your sleeping bag clean of bacteria/sweat. You can use the liner also to help keep safe from bed bugs at camps/hostels. They’re parasites that prefer human blood to animal blood and are often found in hostels and roach motels. Don’t let the bed bugs bite! The liner includes a side-opening with zipper/Velcro closure. The opening on the side makes it easier to climb in/out of the liner. It opens completely all the way down the liner to make the process easier. The liner is also super-lightweight at 237 grams/8.35 ounces. When preparing camping gear for your next camping trip, you’ll want to prevent the issue of hauling tons of extra weight. So this feature of the liner can improve your experience. The sleeping bag liner includes a lifetime warranty and risk-free shopping. So the liner is covered for the unit’s lifetime in case you have any problems. This is a very generous warranty that’s not always offered for sleeping bag liners. Can be used without a sleeping bag. In warm weather, you can use the liner as a stand-alone sleeping bag instead of an actual sleeping bag. It unzips fully so you can use the liner as a double bed sheet (top/bottom). The liner is well-made and is bundled with a sack. Can be used in hotels. If you have allergic reactions to fragrant sheets, you can use the liner under sheets. The width is roomy, and it zips all the way, so it’s easy to get in/out of the liner. The material is also soft. Good for hikers. The zipper is high quality and worth extra weight. The sleeping bag liner packs small, yet there’s enough room inside for large sleeper. Liner dries quickly. The sleeping bag liner includes a full-length zipper that runs down the side and across the bottom of the sleeping bag liner. As a result, you can completely unzip the liner and make one big sheet. The liner is ideal for tall people, yet you won’t have to deal with lots of extra material that can create an uncomfortable situation. That can be a hassle because it can cause you to feel like you’re swimming in the liner. The liner also has a pillow pocket at the top. This is ideal for storing your pillow while using the liner. It helps to secure the unit so your head and neck will be more comfortable when using the liner. This liner is also very soft. The fabric is 100% polyester with a finish that’s silk-like and soft, lightweight, and breathable. In turn, this causes the fabric to feel excellent against your skin whether you’re using the liner with a sleeping bag or as a stand-alone unit. The liner also includes a stuff sack. This makes it easier to pack up the liner when you’re done with it. The liner is quite compact when packed up, so it’s easy to store the liner in your backpack or other bags. When you go backpacking, you’ll want to minimize how much gear you have to haul with you. This sleeping bag liner is bundled with a full guarantee. So if you’re not 100% happy with the product you can return it for a full refund. You also have the option to have the liner replaced instantly if there are any issues. This is a general guarantee that helps to protect your investment. That, in turn, will help provide you with a better hiking/camping experience. The bag is huge. It provides enough shoulder space so you can move around easily in the sleeping bag/liner. The pillow pocket is a plus, and the pillow region could use Velcro to keep it closed. Keeps sleeping bag warmer and cleaner. The liner keeps the sleeper a little warmer at night. You can also sit on the liner when doing tasks like laundry, so the sleeping bag stays cleaner. The liners can be used as a blanket during summer nights. They’re very smooth and pack small. During hot nights you can also sleep only in the liner so you won’t have to install it inside the sleeping bag. Here’s another of the best sleeping bag liners. This unit helps to keep your camping bedding/sleeping bag clean. Camping can be messy when you’re unable to bathe frequently so a liner can help to keep your bedding as tidy as possible. When you rent a sleeping bag, there’s also no guarantee the unit is as clean the company claims it is. In fact, this liner is very easy to clean. You just have to toss it into the washing machine when you need to wash it. One reason this is critical is sleeping bags can be quite tough to wash. So the process is much easier when you’re using a sleeping bag liner. This liner is quite spacious, so you’ll have enough room to move around and stretch in the liner. While you’ll have lots of space, the liner can also fold down to a small pocket when you’re not using it. This makes it easier to carry the item with you while hiking. The liner feels very soft against the skin. The sleeping bag is lightweight and made of 100% polyester with a smooth texture. This makes the liner soft/comfy against the skin. This liner is offered with a 1-year warranty. All of the company’s sleeping bags and liners include this guarantee. The company tests its gear thoroughly to make sure you’re getting the best quality liner. However, the 1-year warranty helps to protect your investment. Here’s our pick for the top liner for sleeping bags: Sleeping Bag Liner by The Friendly Swede. This liner provides lots of benefits. It’s large, so you can stretch out your legs and move around. The polyester is also super-soft against your skin for more comfort. Why is this important? It’ll be easier to get shut-eye whether you’re at a campsite, hostel, or your backyard. The liner provides other benefits too. It’s easy to clean and helps keep your sleeping bag cleaner, which is both plusses in terms of convenience and hygiene. The side opening makes it easier to climb in/out of the sleeping bag when you need to. You’ll also get a generous lifetime warranty to help protect your investment. This best sleeping bag liner from The Friendly Swede is the hands-down the best model we reviewed. Here’s some friendly advice. 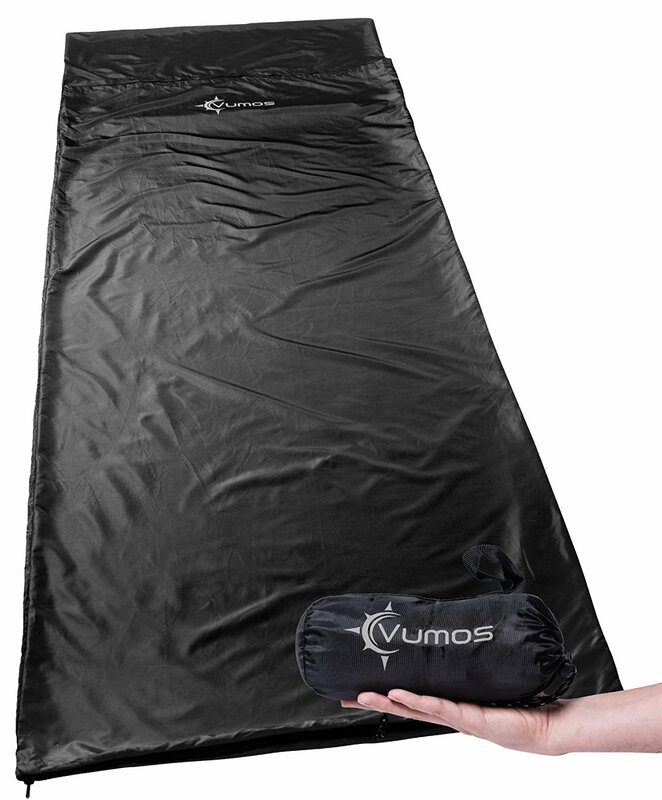 When preparing gear for your next camping trip makes sure to include this sleeping bag liner.